A t a very young age it is important for kids to develop fundamental skills such as balance, co-ordination, motor skills etc. Without these skills learning anything will be a challenge and this is where we place a strong focus during the kids tennis lessons. At Step Ahead Tennis Academy we incorporate these skills into our tennis coaching sessions for that exact reason. Advancements in technology and a lack of professional coaching at school has prevented many kids from acquiring these fundamental skills while growing up. Simple actions such as skipping, hopping, even catching and throwing a ball are no longer things that certain kids are just able to do. It’s for this reason, we believe it’s absolutely necessary in all our kids tennis lessons we do, that these crucial skills are developed and implemented in a structured way. Once these skills are instilled at a young age, future training in all aspects of life becomes easier. We do still however, recognise that kids want to play and learn, and they do so quicker through playing and having fun. That’s why we choose to base our kids tennis lessons on the I.T.F (International Tennis Federation) approved “play and stay” method. “Play and stay” is the method by which we teach kids to “serve, rally and score” in the shortest time possible and by doing so also encourage a competitive spirit. 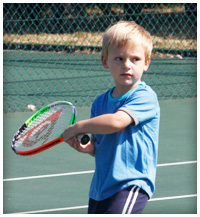 Our Kids Tennis lessons are offered at various venues in the Western Cape and our team of certified coaches will ensure your kid get the best assistance possible. Feel free to contact us with regards to any queries or questions you may have about our kids tennis lessons, from group to individual coaching, we have a plan to fit your needs and more importantly your budget.